Happy Labour Day Monday everyone! Today I have another one of Sephora + Pantone Universe's Elemental Energy Lacquers, this time in the shade Confetti* ($12 CAD). 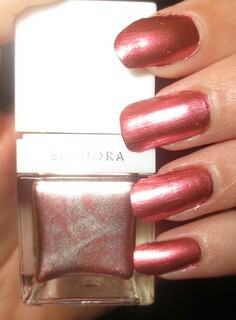 This polish looks absolutely beautiful in the bottle, like a mix of silver and pink chrome. Unlike the first shade that I tried from this collection, Blue Turquoise, this shade is very pigmented. I was almost able to get away with only one coat, but I added a second to even out everything. 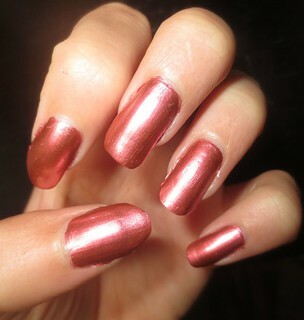 I then added OPI's Top Coat for an added dash of shine. Confetti is an interesting name for this polish, since there isn't any actual confetti glitter in this formula. Even though this polish has a chrome finish, you aren't left without any streaks. This polish is very quick drying, just like all of the Sephora + Pantone Universe polishes that I've tried. 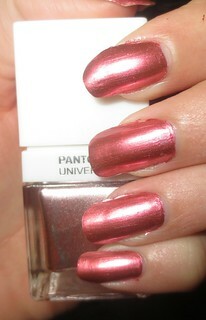 I really love this shade, and I think that it will be appropriate to wear all year round. Confetti also looks beautiful as a pedicure colour.